Be the first to share your favorite memory, photo or story of Coletta. This memorial page is dedicated for family, friends and future generations to celebrate the life of their loved one. 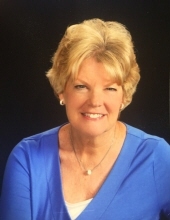 Coletta Flynn O’Brien, age 67, beloved wife of James G. O’Brien for 45 years peacefully passed away on January 25, 2019 at her home in Naperville, IL. She was the cherished and beloved mother of Shannon (Stephen) Janiszewski, Michael (Victoria) and Patrick; loving “Gram” of Jordynn, Matthew and Nadia; dear sister of Thomas Flynn, James Flynn, Marilyn (Robert) Maruna, Maria Flynn, John (Maryann) Flynn; fond sister-in-law to John (Marilyn) O’Brien, the late Mary Jane O’Brien and Megan McGeary. Memorials may be made to: Misericordia Heart of Mercy, 6300 North Ridge, Chicago IL 60660, Park Lawn 10833 S. LaPorte, Oak Lawn IL 60453 or The St. Thomas the Apostle Care Pantry, 1500 Brookdale Rd. in Naperville, IL 60563. A memorial visitation will be Friday, February 1, 9:30 AM until 11:00 AM at St. Thomas the Apostle Catholic Church, 1500 Brookdale Rd., Naperville. The Memorial Mass of Christian Burial will be celebrated at 11:00 AM by Rev. Don McLaughlin. Private Interment will take place at a later time at Assumption cemetery, Wheaton, IL. Friedrich-Jones Funeral Home & Cremation Services, Naperville, was entrusted with arrangements. To send flowers or a remembrance gift to the family of Coletta Flynn O'Brien, please visit our Tribute Store. "Email Address" would like to share the life celebration of Coletta Flynn O'Brien. Click on the "link" to go to share a favorite memory or leave a condolence message for the family.